Earlier on today, I had the wonderful opportunity to participate on an IBM internal webcast, and face to face event (For those folks who could make it over live in the US), around the topic of Apple and how its various products (Macbook and MacBook Pro, iPhone & iPad) are continuing to penetrate the enterprise world, specially, IBM’s, as more and more of my fellow colleagues begin to experiment and play around with these devices to see whether they could be up to the job in helping them be as productive, if not more!, as with other gadgets they may have been using in the past, over the course of the years. The event was several hours long and rather interesting as well as enlightening. It gave us all an opportunity to see how these Apple products could certainly help knowledge workers become more efficient, and although I can’t share any of the materials shown during the event externally, I can certainly tell you that they all corroborated something I have known myself for the last 3 years already… and counting … Apple products *are*, eventually, more than ready for the enterprise! Even, the iPad! Yes, that’s right, we talked about MacBooks and MacBook Pros, about the iPhone and its various perks, specially for the mobile workforce, and, of course, about the iPad and how the latter is also helping shape the way we compute through a new mobile experience. So I thought it would be a good opportunity, once again, to drop by over here and continue further with that series of blog posts on My Top 5 iPad Apps of the Week that I have been collecting through Twitter initially as #elsuapps and share a couple of other interesting links that I have bumped into, since the last blog post, which seem to claim, rather strongly, how the iPad itself is here to stay not only as a superb consumer driven product, but also as a business one. If not, check out the really insightful blog post put together by Krishnan Subramanian over at CloudAve under the title “﻿iPad in Enterprise: IT Folks Can Have One Too” where Krishnan references further a good number of additional links that state not only how business people, but also IT related folks, are turning towards the iPad and liking what they are seeing. So if you can combine both workforces to talk the same language (i.e. “I want an iPad!”) there is great chance that exposure and willingness to have would be rather phenomenal and probably unstoppable. His article surely is a worth while read to figure out what other businesses out there are doing in this space. Check out this wonderful and very enlightening blog post put together by my good friend Victor Ruiz, under the title “El iPad y la educación” (Article in Spanish, by the way), where he comes to share some really good tips on how the iPad can influence education overall, as well as a good number of worth while reading references on how different institutions and organisations are starting to pay attention to this rather innovative way / method of delivering education and training. It surely is another worth while read, and I am certain I would have an opportunity to bring forward a good number of other relevant links related to how the iPad itself will be coming along to a school system near you any time soon! Perhaps at a later time as well, I will take the opportunity of how I feel myself about such device disrupting the way we not only learn about new things, but we actively interact with them all! Stay tuned! FlickStackr: I have been playing with a good number of Flickr related iPad apps and so far I have found two of them that I really enjoy quite a bit. The first one is FlickStackr. And the reason why I like it the most, so far, is because it allows me to not only view Flickr pictures in a wide variety of options, but it also allows me to upload pictures I have stored in the iPad in a breeze and through quite an amazing user experience with every single level of detail considered! Yes, if you are using Flickr, a must-have! BlogShelf: In the past, I have mentioned a couple of iPad apps related to RSS feed reading from Web sites and blogs, with perhaps Reeder, Newsrack and River of News as my favourite ones so far. Yet, I have got a special place for a good number of blogs that I consider special, because I keep coming back to them on a rather regular basis; they are my daily reads, the ones where I take a bit of extra time to digest their content, because over the course of the years I have grown to trust the people behind them as well as meet most of them in real life and somehow having a special place like BlogShelf helps me keep treasuring such a treat when reading their blogs. It’s just like having your own library of essential reading through blogs. I tell you, quit an experience, if you are looking for that unique space that those essential reads of yours would deserve. BeejiveIM with Push: I have been testing as well a good number of different Instant Messaging clients for the iPad and to be honest with you, if I would have to single out only one of them that you would need to look into it, that would be BeejiveIM. It’s a superb iPad app that not only does the job right, i.e. allowing you to keep up with the multiple IM protocols available out there, but also doing a beautiful job at it. It’s almost like you don’t feel you are using IM after all. And for someone who relies so much on it IM to get your job done throughout the day, this is certainly one of those essential must-have iPad apps that you won’t be able to skip for much longer. Go and grab it today! VLC Media Player: What can I say about VLC that folks out there may not know already, regardless of the operating system they may use. VLC is my favourite media player on the Mac, and on Windows, and now on the iPad, too! It’s a wonderful experience to be able to have an application that will allow you to play any kind of media file without a single glitch and providing a very similar experience than what you would get on a Mac, for instance. But better. This time around on the iPad. Now, there are plenty of things I could say about this app, but I am actually going to point you folks to a recent blog post by ﻿Victor Ruiz, once again, who wrote a rather interesting overview of how it actually works and how you can set it up. Article is in Spanish, but you would be able to see how straight forward it is and how well it actually works. Another must-have app, for certain! Trism: And, finally, the iPad Game of the Week. Actually, this is a special one to me, more than anything else because it is not really just for iPads, but also for the iPhone; in fact, it was one of the very very first games I got for my iPhone and I cannot tell the amount of hours I have spent playing some wonderful games in there getting the most out of some of the native concepts behind such devices. If you loved it on the iPhone, there is a great chance that you will like it as well on the iPad. The experience is just as engaging and the challenge, just as tough! Which is ideal, because it is one of the games I play the most when I am off to a long business trip! Endless hours of good fun! No doubt! Ok, folks, that was it for this week! 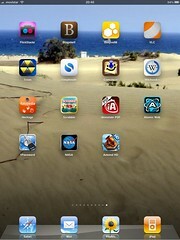 Another round of My Top 5 iPad Apps of the Week for you to have a look and perhaps give it a try to one or two of them. I am hoping you will find them just as useful as I do myself. The truth is that I am finding this series of blog posts rather interesting, because one revealing thought from this series is the fact that I am starting to sort my iPad apps per week on my iPad and somehow that’s given me an opportunity to manage better how I get to find them time and time again, without having to resort to the super nifty search option. It also kind of reminds me of the good number of apps I still have got to share with you all, but that would be the subject for another blog post in its due time … Enjoy them! aha, great! thanks for the cool and nice apps list, well, thanksgiving approaches, here I add some more iPad apps and ipad wallpapers.